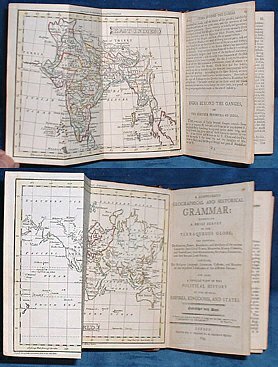 Title: COMPENDIOUS GEOGRAPHICAL AND HISTORICAL GRAMMAR exhibiting a brief survey of the terraqueous globe : and shewing, the situation, extent, boundaries, and divisions of the various countries, their chief towns, mountains, rivers, climates, and productions; their governments, revenues, commerce, and their sea and land forces; likewise, the religion, language, literature, customs, and manners of the respective inhabitants of the different nations: and also, a concise view of the political history of the several empires, kingdoms, and states. Embellished with maps. Description: London, W.Peacock 1795 Hand colored in outline Folding Maps (12 + frontis) by Russell . Duodecimo red roan gilt (spine quite chipped down at head/foot & heavily rubbed/tips worn) All Edges Gilt xxii+404pp +(4p index) 2 leaves nearly loose but clean and square. Nice 19th century inscription on FEP. All folding maps crisp and untorn with outline coloring. Maps: Chart of the world - East Indies - Spain and Portugal - France - Italy - Netherlands - United Provinces - German Empire and Switzerland - Prussia and Poland - Dominions of Russia - Sweden, Denmark and Norway - Great Britain and Ireland - States of America.